The office of Dr. Yu Family Dental is committed to providing patients in the Santa Maria area with exceptional dental care, with a focus on gentle, friendly appointments. We have strived for the past 12 years to be the dentist in Santa Maria that provides excellent dental care, affordable rates, and gentle experiences. Our office employs state of the art technologies such as electronic no-pain injections, instant one-visit crowns, to make your visit as comfortable as possible. To schedule an appointment or consultation, call (805) 922-9910. We treat all emergencies as quickly as possible. If you have a toothache we will usually see you the same day. We are conveniently open til 7pm on Tuesdays and Wednesdays. Our office accepts most insurance PPO plans, offers very flexible financing options, and provides a discount fee rate for those that do not have dental insurance. We also see children under the DeltaCare program. 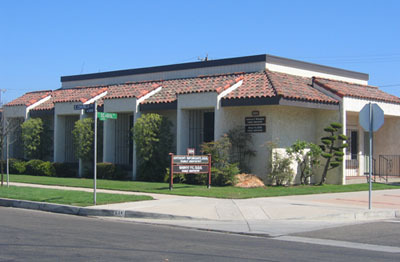 We are located in Santa Maria, across from the St. Mary’s Church near the mall. The closest intersection is Church St. and School St. Our parking lot is across the street from the front door of St. Mary’s church, please look for our blue signs. Take the 101 South. Exit on Main and make a right onto Main St. towards Gudalupe. Make a left onto School St. and go one block. Take the 101 North. Exit on Main and make a left onto Main St. Take a left at School St. and proceed one block.